Ayesha Al Khoori talks to some female Arab horse riders whose families were not always supportive of the sport. When she was a young girl, Salama Al Saadi's family members would laugh about her dream to become a horse rider. She still sought her mother's permission, to no avail. "I want to try, but they implanted fear in me," says Al Saadi, now 22. While the men in her family are allowed to horse ride, Al Saadi's mother believes it is unsafe for girls in particular to engage in the sport. "It's a culture thing," Al Saadi says. "But the idea is still on my mind," she says, believing horse riding will instil in her responsibility and confidence. "I'm not losing hope. I still wish to be a horse rider one day." For 21-year-old Dana Al Mutawa, it wasn't difficult to convince her parents to allow her to ride horses. "Although my father didn't accept the idea for a while, he changed when he observed how devoted I was," she says. Al Mutawa, who has been riding for seven years now, adds that having male cousins and family friends engaged in the sport has "made it easier for my family to go through the process of acceptance". While her parents like seeing her active, her father draws the line when it comes to competitive horse-riding events, finding competitions to be time-consuming. Al Mutawa says this restriction once caused her to briefly withdraw from her family. "But I know they will reconsider it," she says. "And someday they won't pressure me to stop." Her friends were initially against her hobby, but later on became supportive. "Through the years many local girls have entered the equine field, so it became a normal phenomenon in our society," she says. BAHRAIN's Royal Endurance Team riders Abdulrahman Al Saad and Raed Mahmood were fifth and seventh, respectively, at the Compiegne Endurance Horse Ride held in Compiegne, France. Al Saad completed this 160km ride in seven hours, 51 minutes and 35 seconds, while Mahmood crossed the finish line in 7:51:35. The race was won by Qatar's Faleh Nasser, steering Cughenaim Antall De Jalima, who timed 7:49:18. He was followed by a trio of French riders. Jean-Philippe Frances (7:51:11), riding Qrafik La Majorie, came second, ahead of compatriots Philippe Tomas (7:51:12) on Quotien Persky and Enora Boulenger, who were respectively third and fourth. Oman's Mahmood Marhoon finished sixth between the two Bahrainis, with French rider Pierre Fleury coming eighth, followed by Juilien Goachet, Lisa Riou, Geraldine Brault and Cecile Demierre, all of France. Meanwhile, France were first overall among teams, finishing ahead of teams from Brazil and Qatar, who came second and third, respectively. The French team consisted of Jean-Philippe Frances, Philippe Tomas, Pierre Fleury and Lisa Riou. Both Bahraini riders were congratulated by team leader Shaikh Nasser bin Hamad Al Khalifa after the awarding ceremony held at the endurance village. Shaikh Nasser, the Supreme Council for Youth and Sports chairman and president of the Bahrain Olympic Committee, expressed pride after watching his teammates finish in the top 10. He said the results underline Bahrain's strong presence in world-class endurance events, and wished them progress in future races. Faleh Nasser Bughenaim of Qatar won the CEIO*** Nations Cup at Compiegne on 27 May, riding Antall De Jalima in a time of 7:49.18. Following 1 minute 44 seconds later was a close race for 2nd among French riders, with Jean Philippe Frances and Qrafik La Majorie edging ahead of Philippe Tomas and Quotien Persky, and Enora Boulenger aboard Melia Du Barthas. Bahrain's Abdulrahman Mohammed Al Saad was in 5th riding GW Pagena Ox. There were 31 finishers from 58 starters. I love reading the reports from endurance riders from other parts of the world but there seems to be a lack of reports coming from the UK, so I thought it was about time I put fingers to keyboard and attempt a blog for the first time. I've been competing in endurance rides for about 15 years and have only managed to sample endurance outside the UK once - the President's Cup in Abu Dhabi, crewing for a British rider, whose horse was spun after 25 miles. But we got to see the rest of the race in full flow and followed some of the horses along the course in the desert - an experience I'll never forget. We have travelled the length and breadth of the UK to compete in endurance rides but with the ever-soaring price of diesel, we are becoming more selective as to where we go and how far we're willing to travel. The furthest we'll travel now is a maximum of three hours to get to an event. That's probably just down the road for a lot of riders in the USA. My favourite rides are in the North of England - they tend to be a lot hillier and more varied in terrain and generally more of a challenge. A survey of equine veterinary practices in Queensland Australia has shown that veterinarians are stopping doing equine work because of the risks posed by Hendra virus. Hendra virus (HeV) infection primarily affects fruit bats, but was first reported in horses in 1994. During the initial outbreak 14 horses died. Seven other horses were shown to have been infected and were humanely destroyed. Human infections, although uncommon, most often affect people in contact with horses. Of seven cases of human HeV infection, five have involved equine veterinary personnel conducting post mortem or endoscopic examinations. In three cases the infection was fatal. With the 160 km Tom Quilty Endurance ride commencing midnight on the 8th June in Tassie , read a quick history of the event. Endurance riding has been an organised sport in Australia since 1966. Reports of the Tevis Cup endurance ride in the USA began reaching Australia. One person inspired by the concept of a long distance competitive horse ride was R. M. Williams, editor of Hoofs and Horns, a pioneer horse magazine in this country. An invitation was extended through the magazine for people interested in conducting Australia's own 100 miles in one day ride. It was decided if the Americans could do it, so could the Aussies! The venue would be in the Hawkesbury district, near Sydney, New South Wales, being a relatively central, scenic location, with the support of the University of Sydney's Rural Veterinary Centre, Camden. A committee was formed to organise the first 100 mile ride. R. M. Williams wrote to his friend Tom Quilty, a great horseman and cattleman in the Kimberly area of Western Australia. Williams asked for his support for the 100 miles ride, and Quilty donated $1000. This was used to make a gold cup, the prize for the winner of the event. This is a perpetual trophy, and the ride was named the Tom Quilty Gold Cup in his honour. The original Gold Cup now resides in the Stockman's Hall of Fame, in Longreach, Queensland. Cash prizes were originally offered as incentive for competitors, however, at the last minute it was pointed out that local by-laws prohibited racing for money, over public roads. A meeting of riders and officials was held, and all resolved to ride for the satisfaction of simply participating, and for the honour of wearing the handsome silver Quilty buckle. The Quilty buckle is still a highly regarded prize in endurance with those who earn one treasuring it as equivalent to an Olympic Gold Medal. The Golden Horseshoe Ride on Exmoor is well known as the toughest challenge on the endurance calendar. It certainly lived up to its reputation this year, with only two horses successfully finishing the 160km (over two days) class, out of six starters. David Yeoman from North Brewham, Somerset, on his 12-year-old French part-bred Arab Marlouf de Norvavre, won a silver medal, and Linda Kidd, from Marlborough, on her Anglo Arab mare Drastik with AK, also 12-years-old, a bronze. Both riders are Golden Horseshoe veterans, having completed the ride several times before on different horses. David won the Golden Horseshoe 100-mile cup, the Saxon Trophy for the Highest Place part-bred Arab and the Top Man Award. Linda won the Handling & Presentation Award, the Showgirl Trophy for the highest-placed mare, the Dunlop Heywood Veterans’ Award for the highest- placed horse whose rider is 55 or over on the day of the ride, and the Top Lady Award. Successes for South West Group members included three out of the six gold medals in the Exmoor Experience class and a silver in the Exmoor Eighty. Carmen Romer became Dutch Champion when she won the CEI*** 160 km Championship, riding Gitana, at Leersum, Netherlands on19 May 2012. With a finish time of 9:59.55, they were almost 20 minutes ahead of the nearest competitor, Raphael Van Cauter of Belgium, ring Taborah De Sier. Linda Cowperthwaite of Great Britain, riding Marady Mystharon, was third. Five riders out of 10 completed the 160 km. The Netherlands' Daphne Sloots won the CEI** 126 km on Kain in 7:20.53, ten minutes ahead of second place Andre Vidiz and Negreplise. Belgium's Kristel Van Den Abeele and Tizghi de Florival was third. Ten of 15 completed the race. Seven juniors and young riders competed in the CEIJYR** 126 km, with The Netherlands' Marijke Visser winning the ride on Nib Karaskan Star, in 7:20:25. Belgium's Olivia Antoine and Wigor Za came second just 38 seconds later, with Belgium's Romane Yernaux and Gazelles du Bosphore 34 seconds behind in third. Five of 7 completed the race. Ten riders competed in the CEI* 91 km race, with France's Vincent Dupont and Khandjar du Boulve finishing first in 5:47.15, 25 minutes ahead of second place Danny Droghini and Caprice, of Belgium. The Netherlands' Esther Groen and Zakholy's Shadiya were third. Nine riders finished. Palgrave, Ontario - Caledon Equestrian Park in Palgrave, Ontario, was the first sport venue to be named for the Toronto 2015 Pan/Parapan American Games in a special groundbreaking ceremony held May 18. TO2015, the Toronto 2015 Pan/Parapan American Games Organizing Committee, the Government of Canada, the Province of Ontario and the Town of Caledon joined together to announce Caledon Equestrian Park as the official venue for equestrian sport, while also unveiling plans for facility improvements and community legacy. Held during the Caledon National show jumping tournament, competition was halted to allow athletes and their families and friends to gather for the groundbreaking ceremony. Canadian Equestrian Team members Yann Candele of Caledon, ON, and 2008 Olympic Team Silver medalist Jill Henselwood participated in the on-site announcement. Mike Gallagher, President of Equine Canada, echoed those sentiments, recognizing the impact hosting the Pan/Parapan American Games will have on equestrian sport both locally and nationwide. Caledon Equestrian Park is a municipally-owned facility that will host dressage and show jumping competitions during the Games, as well as the dressage and show jumping portions of the three-day eventing competition. A nearby venue in Orangeville is currently under review for the cross-country portion of the eventing competition. TO2015’s venue selection process is based on standards set by International Sport Federations (IFs), approval of the sport program by the Pan American Sports Organization (PASO), and consultation with the National Sport Federations (NSFs). - A new main stadium building. - Permanent spectator seating areas and areas for temporary Games-time seating. - Relocation of and improvements to stabling areas. - A new grand prix ring, warm-up rings and training areas. - A new indoor riding arena. - Infrastructure improvements such as services and grading. - Other related amenities such as blacksmith area and veterinary area. Ontario will be supporting the cost of venue overlay and Games operations through its $500 million contribution to the TO2015 budget. The improvements and upgrades will be overseen by Equine Canada and TO2015 with John MacDonald Architect Inc., a local firm that was awarded the contract in January 2012 through a public tendering process led by the Town of Caledon. Construction is targeted to begin in fall 2012 with completion by the spring of 2014. The participation of Caledon Equestrian Park in the Toronto 2015 Pan American Games will have a significant economic impact on the Town of Caledon. A study conducted by the Canadian Sport Tourism Association for the Town of Caledon found the annual economic impact of these improvements estimated at $15.1 million. “The ‘People’s Games’ will create jobs, support the community, and keep the local economy in Caledon on track for our children and grandchildren,” said Charles Sousa, Ontario Minister responsible for the Pan/Parapan American Games. “We are very confident that Toronto will deliver a great competition and we are looking forward to working on the 2015 Pan Am Games together with the Organizing Committee and Equine Canada,” said Ingmar de Vos, Chief Executive Officer and Secretary General of the Fédération Equestre Internationale (FEI), in a statement supporting the announcement. Attracting more equestrian athletes annually than any other competition venue in Ontario, Caledon Equestrian Park has hosted four Pan American Games selection trials, two Olympic selection trials, 15 World Cup qualifying events, and more than 150 Grand Prix events. Currently hosting 16 equestrian events annually, Caledon Equestrian Park will close out its 2012 season with the Canadian Show Jumping Tournament held September 19 to 23 for the benefit of the Children’s Wish Foundation of Canada. A STRONG contingent of Coastal endurance riders are gearing up for this year's Tom Quilty Cup at St Helens. The Australian Endurance Championships will be held from June 8-10, with a strong presence of Coastal riders expected to tackle the gruelling 160km ride, including Turners Beach rider Fran Jordan. At 66, this will be Jordan's first Quilty, where she will ride her nine-year-old gelding Tierview Saadat (known as Louie). "I've always wanted to compete in the Tom Quilty," Jordan said yesterday. "I only took up endurance riding three years ago and because the Quilty is only in Tasmania once every seven years, as it is shared around the states and territories, this will be my first and probably last opportunity to compete in it." Jordan successfully qualified Tierview Saadat after completing the 160km qualifying ride, the 2011 Sassafras Endurance Ride, in July. 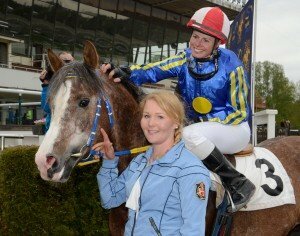 With 28 starts, Maria Hagman Ericsson is not a newcomer to Arabian racing. Well known to the international endurance community, where she competed for Sweden in 14 countries, Hagman – Ericsson has also turned her attention to racing Arabians close to home. Riders from across the UK took part in this year’s Golden Horseshoe Ride, which was held on Exmoor from the 13-15 May. Not put off by the recent bad weather, almost 300 endurance enthusiasts made the journey to Somerset to take part in the pleasure ride and competitive classes at this year’s event. David Yeoman riding Marlouf de Norvavre (who gained a silver medal) and Linda Kidd on Drastik with AK (who won a bronze medal) were the only two to finish the course and pass the final vetting in Class 1 – The Golden Horseshoe – which covers 100 miles/160kilometres split over two days. Says Linda: “Finishing this year’s course means everything to me. I am thrilled to bits with Drastik and depending on how she goes from here, I hope to bring her back next year.” Linda also gave a huge thanks to ride organiser Barbara Wigley and her husband Ian, who made a great effort to keep the ride running this year despite the persistent rain leading up to the event. The High Performance Endurance Panel and the ESNZ Endurance Board wish to advise that with the season at an end the decision has been made that NZL will not be represented at the 2012 World Endurance Championships at Euston Park. The High Performance Panel reviewed various combinations performance records and Andrea Smith with Glenmore Tariq was the only combination to achieve the required consistent performance standard. However Andrea has declined the right to compete at the World Championships as she has a focus on the 2014 World Equestrian Games. The High Performance Endurance Panel is currently reviewing their strategies for the next 2 and 4 years and will look to conduct potential squad member interviews in June this year. Peter Toft has been appointed the interim chef d’equipe for Endurance following the resignation of current chef d’equipe Mark Freeman. Peter will hold the position of interim chef d’equipe until 25th September 2012 following the world endurance championships in August. Equestrian Australia & AERA would like to thank Mark Freeman for his service and wish Peter the best of luck as the new Chef d’Equipe. Arab nations have been heavily criticised for the high incidences of broken legs and dope violations in Middle Eastern endurance yards. The comments were made during a round table discussion at the FEI sports forum in Lausanne on 2 May. FEI endurance judge Jean-Louis Leclerc alleged that multiple horses suffer fractures on single yards per season and he asked what the FEI was doing to improve the situation. The FEI’s Ian Williams said it is looking into causes and prevention of fractures in endurance “to ensure that the welfare of the horse is the central pillar [of the sport] in the future”. The Animal Health Trust in Newmarket is also studying orthopaedic injury rates in endurance horses globally, which will play an important role in the FEI study, he said. The Al Reef-RM Williams Endurance Festival, run by long-time KER clients and supporters Peter and Penny Toft, won the title of Event of the Year at Equestrian Australia's 2011 Sport Achievement Awards of Excellence this month. The Endurance Festival featured the FEI*** National Championships and was the largest endurance ride in Australia in 2011, attracting a record number of entries from multiple countries. In addition to this, the event was designated as a Tom Quilty Cup qualifier and doubled as a qualifier for the 2012 World Endurance Championships. The Endurance Festival and competition was broadcast to a global audience though a live webcast. International officials were offered a unique opportunity to partake in the Australasian Endurance Forum held in conjunction with the festival and competition. Peter Huntington, B.V.Sc., KER's director of nutrition, presented the latest research in endurance horse nutrition during this forum, and KER nutritionist Clarissa Brown-Douglas, Ph.D., attended the festival and competition to provide on-the-spot nutrition advice for riders. ISA Al Hazza was a surprise winner in the Season Ending Endurance Horse Ride Championship yesterday. Some of Bahrain's elite riders competed in this 120-km night ride, which was held at the Bahrain International Endurance Village in Sakhir. But it was the Royal Endurance Team who dominated the show, securing a 1-2 finish as they lived up to their top billings. Riding Garibha, Al Hazza completed the five-stage ride on top in five hours, 21 minutes and 31 seconds and with a 22-km per hour average speed. Shaikh Nasser bin Hamad Al Khalifa, the Royal Endurance Team captain, followed his teammate in second place on Warraba in 5:38:09 and with an average speed of 21-km per hour. Sultan Salim Al Hadhrami, representing Al Asayel Stable, rounded off the podium by coming third on Sche in 5:49:40 and with a 20-km per hour average speed. The Royal Endurance Team riders headed into the concluding event of the season as favourites. Indeed they lived up to many expectations as team member Ahmed Abdulla led the 30-km first stage in 1:13:27. He was closely followed by Mohammed Abdulsamad (1:17:19) of Al Khalidia Stable and Shaikh Nasser (1:18:00) in second and third places, respectively. Shaikh Nasser then moved up to top spot at the end of the second stage, which was also over 30 kms in 1:18:31. The Royal Endurance Team skipper completed the stage ahead of Shaikha Najla bint Salman Al Khalifa (1:19:07) of Ahmed Al Fateh Stable, who came second, while Al Hazza (1:19:26) was third. In the 20-km third stage, Shaikh Nasser extended his lead to 54 minutes and four seconds, while Shaikha Najla (52:56) and Al Hazza (52:54) maintained second and third position, respectively. Shaikh Nasser held on to his solid lead after finishing the fourth and penultimate stage, which also covered 20 kms in just 57:33 minutes. Shaikha Najla, however, was eliminated from the race after failing to pass the veterinary examination after the fourth stage. Excitement mounted in the 20-km fifth and final stage as Al Hazza took over the lead from Shaikh Nasser in the final moments to capture the trophy. The prize-presentation ceremony took place at the endurance village right after the race. It was attended by Bahrain Royal Equestrian and Endurance Federation (Breef) president Shaikh Khalid bin Hamad Al Khalifa, who honoured the top three riders. Shaikh Khalid also presented certificates of recognition to members of the veterinary commission in appreciation of their efforts in making the event an all-round success. Veterinarians from Bahrain, Kuwait and Oman were part of the organising committee. The commission has nine members, headed by president Dr Yassine Motemri of Tunisia. Other members are Mohammed Al Hammad, Mohammed Al Daen, Kuldip Kuhad, Zahid Rafiq, Ebrahim Yousif, Sabah Al Kabie, Abu Obaidah Yacoob and Abdelrahman Abu Shook. Despite wet weather forcing the cancellation of many equestrian events in Britain this season, the country’s most famous endurance ride will go ahead as planned. Organisers of this year’s Golden Horseshoe Ride have alternate routes planned should sections of the track become too wet. The event, on Exmoor from May 13 to 15, has the usual combination of hills, moorland, firm tracks and river crossings. The Endurance Round Table session, which shared the final morning of the FEI Sports Forum with the Eventing Round Table, attracted representatives of National Federations (NFs) and veterinarians for discussion on proposed rule changes that will be presented to the FEI General Assembly 2012 in November. Various proposals made by the FEI Endurance Committee were debated before the meeting was opened up for general discussion. The FEI Technical Committee has undertaken a full review of the present rules for Endurance Riding in the context of the rapid expansion of the discipline worldwide. The major rules changes, dealing with qualification, entries and the composition of championship teams, all received unanimous support from the participants. The changes involved the introduction of an Elite status for Junior, Young and Senior Athletes, the possibility of bringing spare horses to competitions, and adopting a format that would allow all six members of a squad to contribute to the final team result with the best three scores counting. Under the proposed new rule, to achieve Junior/Young Rider Elite Athlete Status, athletes must have successfully completed a minimum of 10 CEI 2* 120km events or higher. To maintain this status, they must successfully complete at least one CEI 120km or higher event within every successive 24 months. Senior Elite Athlete status would be awarded to riders who successfully complete a minimum of 10 CEI 3* 160km events or higher. To maintain Senior Elite Athlete status, Athletes must successfully complete at least one CEI 160 km within every successive 24 months. FEI Veterinary Delegate Frederic Barrelet (SUI) suggested that, apart from these qualification criteria, any disciplinary action within the 24-month status-maintaining period should be taken into account. The suggestion was taken on board by the Committee. There was also strong support for changes in the rules relating to establishing the field of play, and the creation of the role of course designer. This new role will have a direct bearing on the level of safety and challenge of the courses. The FEI Technical Committee also sought feedback on the final horse inspection and whether to change it to make it more spectator friendly. The welfare perspective was also to the fore when former Endurance Committee member Jean-Louis Leclerc (FRA) asked for information about what was being done to address the incident of fractures in competition. Ian Williams confirmed that the FEI has been looking into both the causes and prevention of these types of injuries “to ensure that the welfare of the horse is absolutely the central pillar of endurance in the future”. He stated that there is an ongoing review in FEI Headquarters, compiling facts and figures to create the safest possible environment for Endurance horses. Mr Barrelet also reported that Annamaria Nagy (HUN), based at the Animal Health Trust in Newmarket (GBR), is currently doing a PhD on orthopaedic injury rates in Endurance horses globally. This data will also play an important role in the FEI study.